The main element of any accusation of a DWI offense by law enforcement is that the person accused of such an offense is, in fact, intoxicated during the time of their arrest. In many cases, when a person is arrested for DWI offense in the state of Texas, they don’t undergo any chemical testing to prove the arresting officer’s allegation of DWI until sometime after the arrest has been made. Any lawyer/scientist or DWI attorney in Houston, who knows his craft, will tell you that a person’s body chemistry changes over time and has its own implications for the validity and credibility of chemical tests related to DWI arrests conducted by law enforcement. To put it simply, if a person is or has been drinking, their blood alcohol concentration levels will change over the course of time making most field sobriety testing and blood-alcohol chemical testing, unreliable, and unfit for courtroom trial. What normally happens in these situations, especially when the DA is desperate for a conviction, is the pulling of an expert witness out of one’s hat. Retro-grade extrapolation is the nomenclature assigned to the hocus-pocus scientific process normally sold to Galveston and Harris County jurors by the expert witnesses of the prosecution. It basically means that the prosecution, with the assistance of their very own expert witness, will attempt to use their chemical evidence in such a way – as to travel back in time, via the chemical evidence, to hypothesize the intoxication level of the defendant during the time they were driving their vehicle. 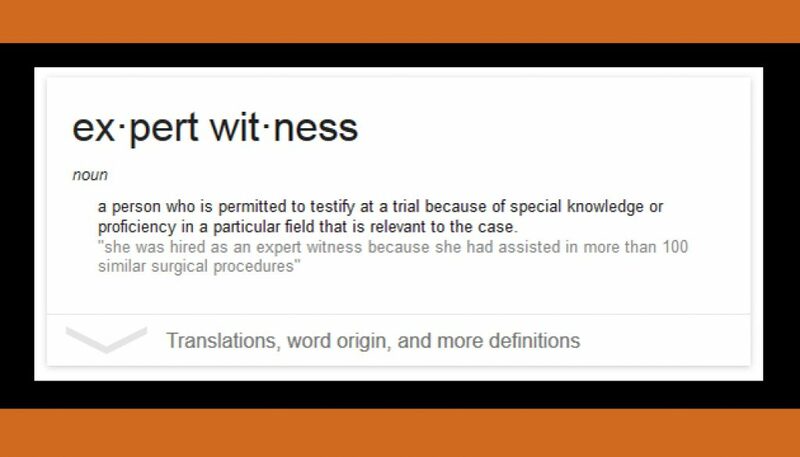 In the state of Texas, the testimony of an expert witness must be vetted by the courts, so to say. For the expert to be allowed to offer any testimony on behalf of the prosecution at trial, the court must find that the opinion of the expert can be counted-on for it’s reliability. There are a number of factors the court will consider when making the determination of whether or not an expert witness and/or the evidence, are in fact reliable and admissible into court. One of the factors is the length of the time between the DWI arrest and when the DWI blood chemical examination test was administered. Another one of the factors considered by the court when determining reliability of evidence is the number of tests given to the defendant, the amount of time that passed between each test, and if whether or not the expert is aware of any individual physical characteristics specific to the defendant. A few examples of individual physical characteristics that may be specific to a defendant, that may affect the reliability of expert testimony and testing, often include the weight, the gender, normal drinking patterns on part of the defendant, the defendants individual tolerance for alcohol, the quantity of alcohol ingested during the time-frame in question, what the person drank and for how long they drank it, and the eating patterns of the defendant. Attorney Tad Nelson is well aware of the differing changes to a person’s body chemistry while drinking, as well as how people are affected differently by different amounts of alcohol under different circumstances based on an ever-changing body of evolving circumstances. Having a prosecutor after you for a DWI offense that you probably shouldn’t be prosecuted on is no laughing matter. The legal process can take a toll on the defendant, the defendant’s family, the defendant’s professional life, and especially the defendant’s finances. If poorly represented, prosecution for DWI offense can even affect the defendant’s freedom. If you need help, contact the Law Offices of Tad Nelson and Associates immediately. The faster you contact an attorney, regardless of whether you contact us or not, the better chance you have an gaining a favorable disposition from the court of law in the event that your case goes to trial. In most cases, DWI charges can be plead out with no jail time and/or a small fine, or even dismissed. If you need help with this type of situation send us a message or call Tad Nelson at 281-280-0100.